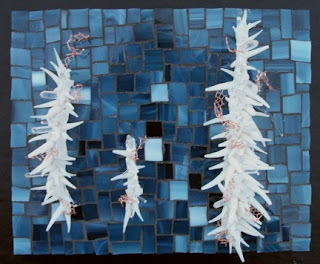 Margo Anton's Mosaic a Day: "Breaking Through"
Okay, admittedly, this piece was not done in one day. There were actually 4 steps involved: mosaicking the background, grouting the background, gluing in the copper bits, letting that dry, then gluing in the spiky bits. So it's a bit of cheat, although total time was no more than I usually spend on a MAD. I just love sea spikes, and I really liked incorporating the little bits of copper. These have NOTING to do with mosaiics. Shame on you! I'm curious as to why you don't think these are mosaics.